This children’s book is the last of three books that began with Hatchet, a wildly successful wilderness survival story. I didn’t read the second of the three, but I imagine that any young reader who adored the first, would likely want to read the next two. This last children’s book is a quiet, thoughtful book, as we watched the hero of Hatchet contemplate his return to the wilderness. More than anything, the book is a contemplation on finding one’s own place. At the same time, it is a mild commentary on the dearth of soul in our contemporary world, especially for teenage boys. It can be hard to make a children’s book compelling when much of it revolves around thoughts and flashbacks, and yet I think Paulsen succeeds quite well in making it all seem real and come alive. Since the author himself spent much of his time in the wilderness, the book resonates with a true experience, and the longing of young people to find their own way. 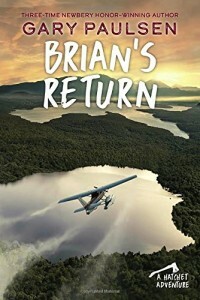 Brian’s Return is a fairly quick read, a short book, and well-written. I was glad I read it, and I think that it will be satisfying to young people, boys or girls, who wonder whether there is more to life than the superficial episodes that are offered to them in the name of civilization. I appreciate the dilemma that the author has, in presenting a positive experience of the wilderness without completely negating civilization. The ending is vague enough to leave us wondering what might happen in the future to our hero.